The Week in HD - Monday 22nd October | What Hi-Fi? Welcome to The Week in HD - our guide to all the best high-definition and 3D films, TV shows and sports to grace your screens. It'll be a full year before the next series of The Great British Bake Off, so forgive me for this last baking-filled week! There's plenty of great films on this week as well, along with the last episode (ever?) of the current run of The Thick Of It, and the Crime Thriller Awards 2012. 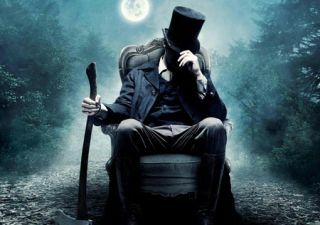 In the wake of literary monster mash-ups such as Pride and Prejudice and Zombies, Seth Garahame-Smith wrote a re-imagined historical fiction about Abraham Lincoln. No seriously, watch the trailer before you judge. It looks hilarious, sort of a Lock, Stock meets Shaun of the Dead zombie mash-up, and happily never takes itself seriously. Masterclass, part 1. The competition may be over, but the show ain't over til Mary Berry and Paul Hollwood takes us through all those dreaded technical challenges from this season: treacle tarts, rum babas, creme caramels, hand-raised pies and the eight-strand plaited loaf. There's already been much debate across the pond over Lena Dunham's take on four fresh-out-of-university twentysomethings living in New York – either being called fresh and 'edgy', or homogenous and privileged – and the jury's still out on our side, but it could be worth a look, if only for those skyline shots of New York City. A modern-day take on Sherlock Holmes? Now where did American network CBS get that idea? Cries of outrage and fury may have accompanied the first news that the Americans were doing their own version of our beloved and most excellent BBC Sherlock - and while it probably won't be able to match the love and care given by the Moffat/Gatiss team, it should be entertaining at least! Jonny Lee Miller takes up the great detective mantle, with Lucy Liu stepping in as Joan Watson – other deviations include Holmes being sent to NYC by his father as a form of rehab... More Sherlock Holmes can only be a good thing, right? We can hope. There's a great line-up tonight, with Dionna Warwick celebrating 50 years since her first single was released, Bloc Party's new album following a three-year break, and another anniverversary: 40 years since School's Out, Alice Cooper plays some classic rock tunes. Also performing are: Alt-J, Josephine Oniyama, and Charley Pride. Masterclass, part 2. Paul Hollywood and Mary Berry take us through the rest of the technical challenges from this season, showing us how to make our very own queen of puddings, chocolate tea cakes, jam dougnuts, frasier cakes and fondant fancies. Science is amazing, especially space science. As we wait for the BBC documentary on Felix Baumgartner's record-breaking free-fall from space, here's something equally extraordinary. In 1977, two unammed spacecrafts were launched by NASA to boldly go where nothing has gone before – to expore the farthest planets of our solar system. And now, after 35 years and 11 billion miles, the two Voyagers are leaving the area of the sun's influence. Carrying message from Earth in the form of a golden record that describes our civilisation, it's only a matter of time before we have exciting new discoveries and a possible Cylon attack. Drama about the true story of boxer Micky Ward and his Rocky-esque rise with the aid of his former-boxer-turned trainer. Starring Mark Wahlberg, Amy Adams, and an Oscar-winning Christian Bale. This is the last one, I promise. You'll have a whole year without another mention of the Bake Off! So tonight, Mary and Paul show us what they would've chosen to cook as their signature bakes: sponge puddings, flat breads, wellingtons, sweet buns and tarte tatins. Celebrating the best genre of them all – mystery and crime fiction – in the world of book, film and TV. Techincally, the actual awards happened last week, so I already know the winners. All I'll say is that the best people and stories won and you shouldn't miss it! Alexander Armstrong guest hosts tonight's episode, with Victoria Coren and Conrad Black joining regular captains Ian Hislop and Paul Merton. Action film about how death row inmates take part in a deadly motor race, where if you kill an opponent, you win your freedom. We'll ignore the silly plot because Jason Statham is in it, and he is cool. Journalism. Shappi Khorsandi, Ross Noble, and Johnny Vegas join Alan Davies and Stephen Fry share interesting facts and anecdotes about journalists and journalism. It's a James Bond special tonight, with 007 himself, Daniel Craig, joined by Judi 'M' Dench, and new Skyfall villain Javier Bardem. The last episode of this series – it can't already end, can it? After the massive fall-out from last week's one-hour long inquiry special, and every blame put on DOSAC's shoulders, Malcolm sends Dan Miller off on a police-fact-finding mission...but does he have another motive (of course he does!). Quentin Tarantino's stylised vengeance thriller has a Western theme for Vol 2, with Uma Thurman's The Bride tracking down and annihilating the remaining members of the Deadly Viper Assassination Squad, before getting to the eponymous Bill. The godfather of comic books, Stan Lee has been responsible for co-creating legendary superheroes such as Spider-Man, the Hulk, the X-Men, the Fantastic Four, Iron Man, Thor...and making brilliant cameos in all the new Marvel films of late. In this special, he takes us on a journey in Marvel Comics, and tells us of his inspirations for all his characters. Misfits is back, minus a couple of cast regulars. But with two new characters Finn and Jess joining Curtis and Rudy with brand new powers, it can only be a matter of time before another unlucky probation officer meets a messy death. Derren Brown is back with his mind-bending manipulating tricks/illusions, this time convincing one man that he is the sole survivor of a total destruction of Earth following a meteor strike...and that zombies walk amongst us.